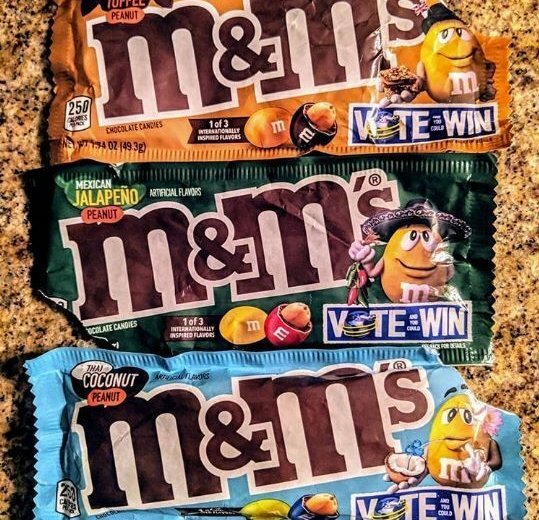 According to Popsugar, the expected release is "Winter/Spring 2019," and the flavors are being released as new version of the contest M&M's held last year to find a new "Crunchy" variety flavor. WASHINGTON — M&M’s is releasing three new flavors in 2019. According to an Instagram post by Brent Timm of SnackChatLive, a food vlog, those flavors are Thai Coconut Peanut, Mexican Jalapeño Peanut and English Toffee Peanut. All three will be variations on the traditional Peanut M&M’s. According to Popsugar, the expected release is “Winter/Spring 2019,” and the flavors are being released as new version of the contest M&M’s held last year to find a new “Crunchy” flavor. Last year’s contest pitted Crunchy Espresso, Crunchy Raspberry and Crunchy Mint against each other. All were released for a limited time, but Crunchy Mint won a permanent spot on the supermarket shelves. It’s expected this year’s varieties of Peanut M&M’s will be part of a contest as well.